Queen of Mars is the latest slot release by the software provider Merkur Gaming which is taking players into a space adventure to explore Red Planet and its kingdom. Mekur stepped up its game and raised to the industry standards with embracing the ideals of modern gaming in terms of both visuals and sounds, while also making improvements to the gameplay. Merkur Gaming designed and developed a truly unique-looking slot. They took their inspiration from a human civilization living on Mars and combined the old and new in a single game. The Queen of the Mars looks like a medieval ruler and although the symbols on the reels are made out of gold, they look quite futuristic in design. Beautifully designed symbols are represented by spaceships, planets, crowns, different gadgets and Royals. Five spaceships on a payline will reward you with 5,000x your stake. Mars is a mixed scatter-wild symbol, as part of a holographic projection. It can substitute all symbols to make winning combinations and pays 200x your stake by itself. Landing three symbols of Mars, you trigger 10 free spins. During the free spins feature, one random symbol is selected and each time it appears it will expand to cover the entire reel. This drastically increases your chances of filling a screen with high-paying symbols. 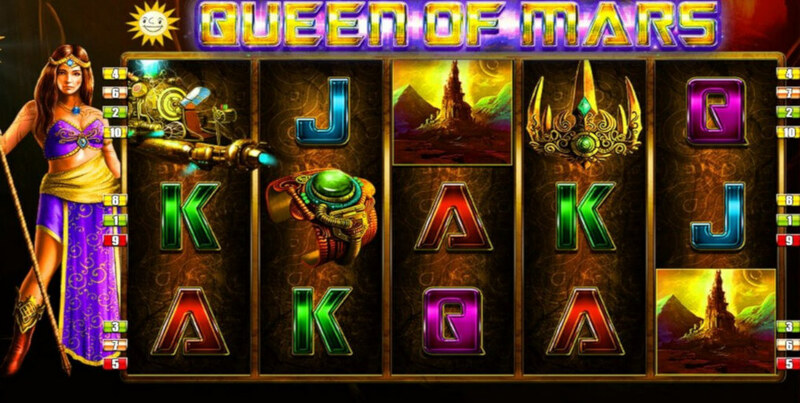 Queen of Mars also offers two gambling options, the ladder and card gamble. In the card gamble, you simply choose between cards and if you choose the right one, you double your bet. The ladder is a bit complicated but it will make your heart beat like crazy. You end up stepping up and increasing your win or stepping down and losing it all. Queen of Mars lays on a 5×3 grid and offers ten fixed paylines. With decent RTP of 95.94% and features including free spins, expanding symbols and gamble you have something exciting to look for. The betting options run between 0.10 and 20 coins per spin which means you can wager between $0.10 and $20. If you bet at the maximum value, you can win 5,000x your stake in a single round, meanings your possible win is up to $100,000 if you fill the reels with wilds and jackpot symbols.